Goddess Durga is a very powerful Light being who is assisting the liberation of this planet. In her traditional myth, an evil being conquered the whole Earth and then started to conquer the heavens also. The Gods and Goddesses were not strong enough to stop him and so they had a meeting to find a solution, during which the voice of the Divine Mother of the Universe came through from deep space, and told them that they should all unify their power, and she will incarnate through their unified energy and restore the peace. 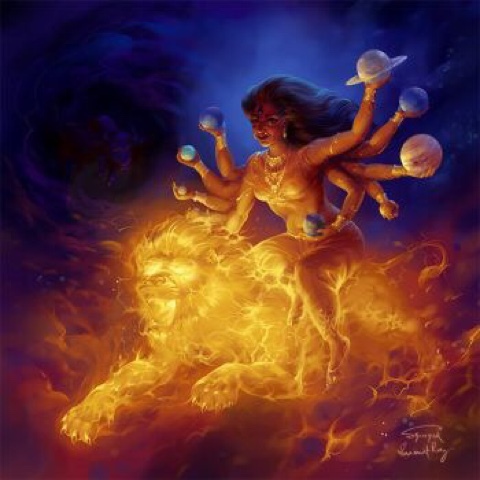 So all Gods and Goddesses merge as one being of Light, and Goddess Durga is born, she destroys all evil and brings back peace and freedom to the Universe. The myth symbolizes the tantric truth that our unified power is necessary to bring back the Light to this planet, how Lightworkers need to work together for a common purpose, and also how all inner aspects of ourselves need to activate and balance and connect together. 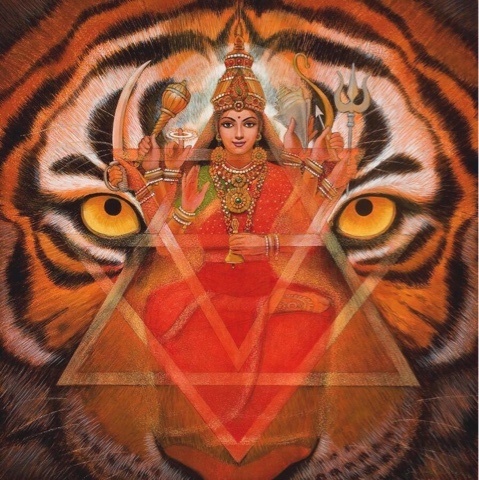 Goddess Durga's energy is a powerful help to achieve this inner and outer unity, to bring back the Light, and she is also a powerful protector and healer that we can call for personal and planetary situations. 'Indra bowed to the Gods and told them of their problems. When Indra finished, the entire place resounded with a voice, a strong and melodious voice, the voice of Mahadevi, the great Goddess, the Divine Mother. "Children, use all your powers together to create a great power. The three Goddesses should come together. I will incarnate there in the form of a great Goddess. Gift her with all your powers, she will solve all your problems." Hearing this, the three Goddesses - Saraswati, Lakshmi and Kali, smiled. They were all incarnations of the great Goddess. Now their mother wanted to create another power strong enough to destroy all evil. The three of them merged together. When they came together, Brahma Vishnu and Shiva gave out a powerful white light, which fused with the merged bodies of the three Goddesses. The light was so fierce that it could not even be seen by Devas with their eyes. From this light emerged a woman with a thousand hands. The Goddess looked ferocious and beautiful at the same time. The Goddess introduced herself in the same melodious and strong voice of Mahadevi, "I am Durga [Durga in Sanskrit means "the invincible"]. I am the incarnation of the Divine Mother and I have come here to destroy all evil."